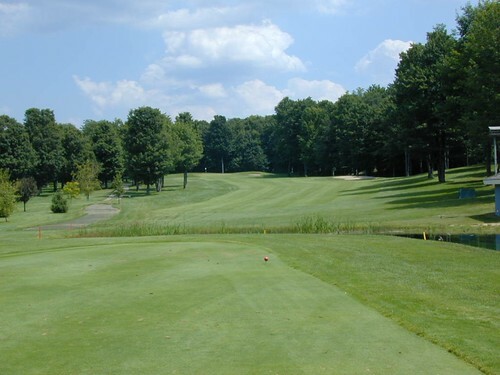 Five miles west of Gaylord in a setting of hardwoods and gently rolling terrain is the Gaylord Country Club. This not a private club, and you can walk it if you so desire. This is one of the four courses that was here when I arrived, and it has developed into one of the most enjoyed in the mecca. Designated by Golf Digest in their Places to Play supplement as a “GREAT VALUE”. It’s been called “The best kept secret in the North” by one paper. This should tell you that this is one that you will like. When you talk about the Country Club you talk about the greens, they will compare to any, bar none. How many greens can you hit into with a long iron and expect it to check up. You can here. Many of the breaks on these greens are so subtle that you hardly see them, but they are there. Over-reading the greens is another problem. Play them to break four inches, it will break three. As you may have guessed, short putts are not my strong suit. (I get very few gimmeys) You will enjoy the challenge of these greens. The par threes are roughly the same length,(150-160 yds, white tees) but they are well bunkered, and depending on pin placement can be a real bear. There is enough trouble around these greens, that if your not on, be close. This is a dog leg right, that you must hug a pond to have a shot to get home in two. You could try to drive the pond but that take’s 200 yards plus of carry, and there is O.B. to the right of that. The green is well bunkered (of course) and going for the bird gets the bogey as often as not. The par fours are a very good mix of short, medium and long holes. The shorter the hole the more trouble there is to get in to. 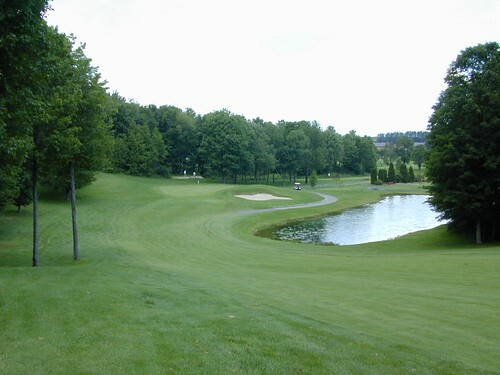 My favorite hole on the course is a hole that has been driven. It has three large traps and a small pond to protect it from the very brave (or foolish). 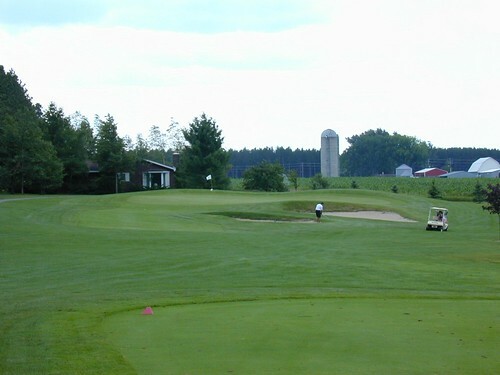 A good drive leaves you a simple wedge in to a good size green. You still have to clear the sand or pond. If you are like me, you give it a little extra, which leaves you to the back of the green with a down hill putt back. Its just a great little hole that tests your nerves and skill, not you power. All and all, the whole course is like that, a skill course more than a power course. 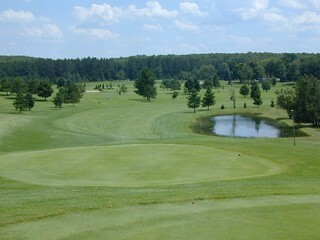 Great greens, nice setting, well maintained. What more could you ask for.